Cancer cells metastasize by leaving their initial tumor site and squeezing between other cells to enter blood vessels, which they use as highways to zoom through the body. The metastasizing cells again squeeze between other cells to leave the blood vessels and enter tissues to form metastases. T-antigen, a combination of specific sugars, is detected on proteins on metastasizing human cancer cells, but is not normally found in most adult tissues. As immune cells in the fly, called macrophages, also carry T-antigens and squeeze through other cells to enter tissues, Daria Siekhaus and her group decided to use the fly and its immune cells as a model to study how the appearance of T-antigen on proteins is regulated and which proteins are affected by this. “The fruit fly is the best place to identify new pathways, as it is fast to do complex genetic experiments in the fly. Here again, we used the fly as an initial discovery engine for a problem that is also pertinent to us humans,” Daria Siekhaus explains. The researchers investigated which proteins Minerva affects T-antigen on. 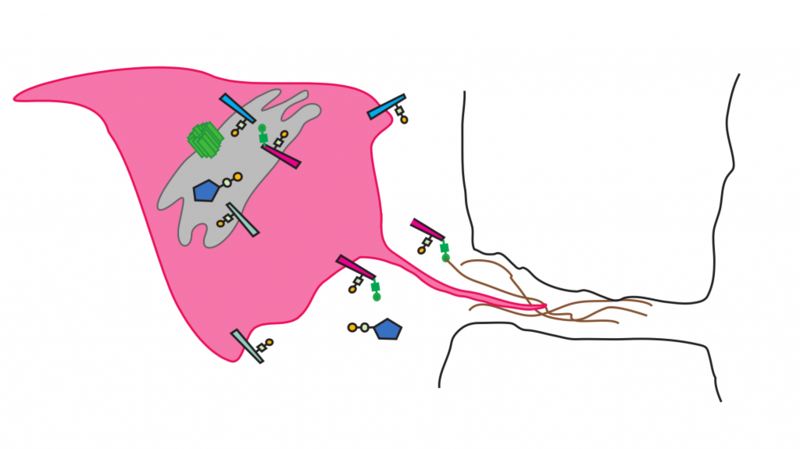 By collaborating with Sergey Vakhrushev and Henrik Clausen at the University of Copenhagen, the group had access to a mass-spectrometry technique that let them find which proteins carry the T-antigen sugars when Minerva is present but show reduced levels when Minerva is mutated. They thus identified a set of proteins which need Minerva to display T-antigen. The large majority of the proteins identified that have a version in vertebrates, a so-called ortholog, are involved in cancer. “Nine of the proteins we found have an ortholog in humans, six of these are linked to cancer in some way. This is intriguing!” Siekhaus says.